Provide your guests with delectable, nutritious plates at your next event! 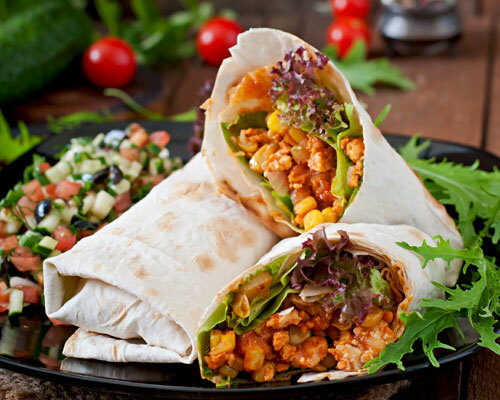 We offer you a wide range of delicious catered food options that everybody will enjoy for any occasion! Why stick with the usual boring and unhealthy meals that most catering companies offer? Nutri Truck offers amazing fresh and natural food options of the highest quality, which is why we are the top choice for event catering in Tampa. We define our catering service as a dream come true in a party, meeting or any celebration. We combine and offer all types of cuisines, from Mediterranean, Caribbean, American, Mexican, Japanese, Spanish, Italian and more. Our service options include: buffet style, stationed foods, coffee breaks, luxury menus, cocktails and anything in between. In addition, we offer healthy options such as vegan or low fat choices. No matter what your next event is, our team of culinary masters can create a menu that is tailored for your needs! All of our meals use the best ingredients and are free from any processed foods or refined sugars, giving a new and healthier dimension to traditional event catering services. Take a look at a sample of some our delicious menu items! CHEDDAR CHEESE, PICO DE GALLO AND BEANS. From weddings to corporate parties and everything in between, Nutri Truck can provide you with large amounts of remarkably healthy food for your next event. Simply fill out the form below and our team will contact you to begin putting together a delicious catering menu that your guests will love!